Within two hours of arriving in Mammoth Lakes, I was pedaling toward the base of 'Puke Hill' wondering whether its name would prove true. Actually, I was pretty sure I would soon be adding another account of trailside hurling to the lore of the short, but punishing climb as I gasped for air to fill my oxygen-deprived lungs. I was about suffer up Puke Hill–known to locals for its appearance in the weekly Village Championships XC race course–as a 'warm-up' for a three-day tour of the trails in and around the famous mountain town. Mammoth Lakes sits at 7,880 feet above sea level in California's Eastern Sierras, which is approximately 7,870 feet higher than where I usually ride, and my sea-level lungs and legs could already feel the altitude. 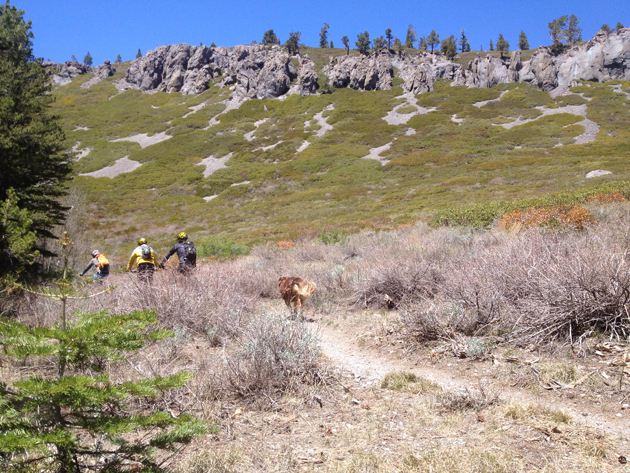 Thankfully, I held my lunch down and kept my pride intact as our group crested the hill, where we were promptly rewarded with a fast, bermed, pine-tree-lined singletrack descent that dumped us onto another fire road below. We spent the next two hours linking bits of singletrack with fire road connectors in the Shady Rest trail system, whose best attribute is that it's an easy 5-minute-pedal from pretty much anywhere in town. 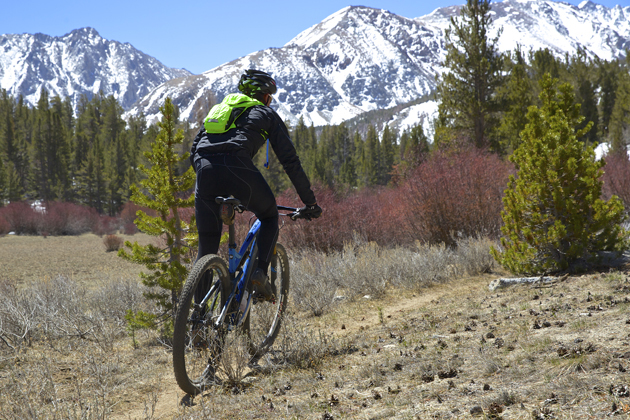 In the mountain-bike world, Mammoth is known for its eponymous ski resort and the bike park and singletrack there, as well as the legendary Kamikaze races. The trails off the mountain don't get nearly the same attention, although they are definitely worth a trip on their own, and it won't cost you a lift ticket. Here's the thing about Mammoth Lakes: It sits along the edge of a caldera in an extremely active geological area. While this region's volcanic past makes for soothing natural hot springs and picturesque landscapes of craters, domes and lava flows, it also means lots of rocks. Mammoth isn't known for its dirt because it doesn't really have much. This does not mean the riding suffers, but it's important to keep an open mind. We went to sleep that night sated by margaritas and Mexican food, but slightly restless thanks to the tinge of anxiety instilled by the locals about the high-altitude hike-a-bike awaiting us in the morning. 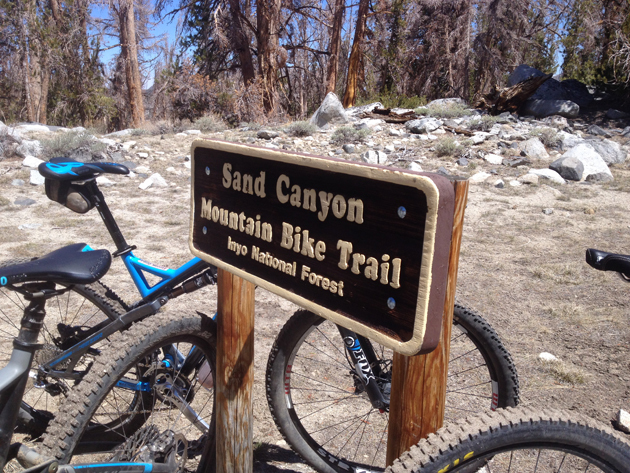 That next day started with a shuttle up Rock Creek Road, a 10-mile paved ascent off Highway 395 about 20 miles south of Mammoth Lakes, to access the Sand Canyon Mountain Bike trail in the Inyo National Forest. 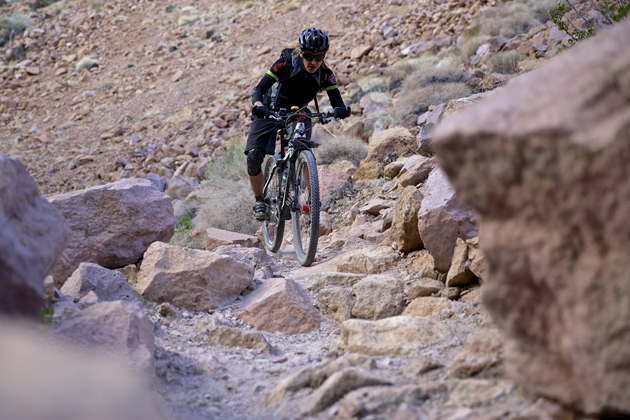 True to the guides' word, the first mile or so of trail is a mix of push sections to get up and over large boulders, interspersed with a few rideable snow patches until you summit Wheeler Crest at just over 10,000 feet. The one nice part about heaving your bike up a steep pitch at altitude is that you're huffing along slow enough to appreciate the spectacular scenery in every direction. We happened to visit during a brief window when the high-alpine trails are dry, but the towering 13,000-foot peaks are still snowcapped¬–a truly beautiful time in the backcountry of the High Sierras. When you reach Wheeler Crest, it's time to flip the switch into shred mode. From here, we tore down 3,700 feet through 10 miles of wide-open meadows, creek crossings and rock gardens, much of it on a doubletrack fire road that leaves no question about how the trail earned its name. The sand, however, is never too deep to power through and you can truly fly on the wide open path, the cool air warming as the trail drops through aspens, then pine forests and down into the foothills. Sand Canyon links up to Wagon Wheel, a 2-mile singletrack that drops almost 900 feet over slickrock and small ledges reminiscent of Moab. From where we popped out on Lower Rock Creek Road, it's a 15-minute shuttle up to the junction with Highway 395 to connect to the Lower Rock Creek Trail, which is probably the area's preeminent ride (with good reason). The 8-mile point-to-point parallels the creek on an old fishing trail that descends a total of 2,000 feet of perfectly flowing spaghetti strands. The first two parts of Lower Rock Creek are smooth, fast and fun, and the third is more technical with some tricky, tight, potentially derailleur-destroying rock sections. Like much of the riding around Mammoth, it's the scenery as much as the riding that makes Lower Rock Creek so enamoring. The trail drops through aspen groves lined with lush green grass and snakes underneath towering walls of volcanic tuff on its way back down to the paved road. There are many more trails to explore right from town including the Mammoth Rock Trail, which traverses an expansive ridge directly below the landmark glob of geological history of the same name and the rolling Uptown and Downtown trails that rise and drop from town to the ski mountain. There is no mountain biker alive who wouldn't have fun on the rollers, berms, twists and turns that mark these trails. 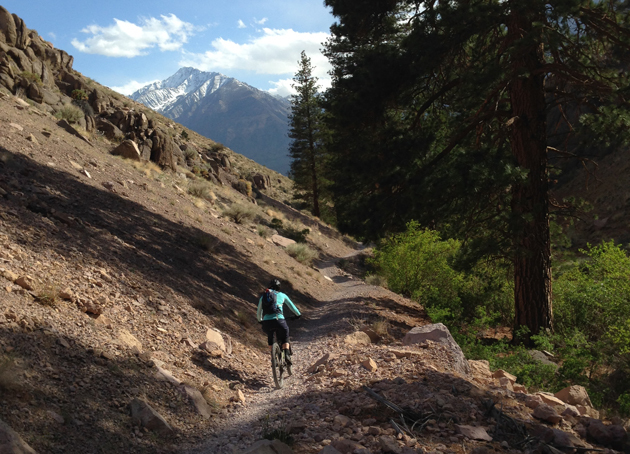 In total, the Mammoth Lakes Trail System includes about 300 miles of singletrack, double track, multi-use paths and soft-surface trails, and the best still could be yet to comes. The town is working with the Forest Service to gain approvals to build up to 30 new trails in the region, although that's expected to take several years. Plus the town approved tax measures in 2008 and 2010 that earmark $1.8 million for recreation projects per year indefinitely. 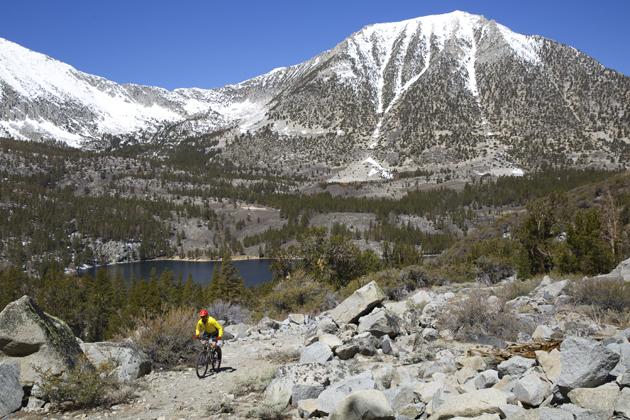 There are challenges to developing Mammoth Lakes into the bucket-list mountain-bike destination that the town hopes to become. The town is nearly surrounded by three different wilderness zones, which pretty much means mountain-bike trails are off limits; the lunar-like landscape is difficult to build in; and there are multiple jurisdictions that must approve new projects, each in a time-consuming process. But John Wentworth, CEO of Mammoth Lakes Trails and Public Access, believes with that foundation laid, over time, mountain bikers will take notice of Mammoth's uniqueness, and word will spread. "There are unbelievably great mountain bike experiences to be had, but not the ones you typically think of. In the summertime, you can be riding doubletrack forever and not see another person. 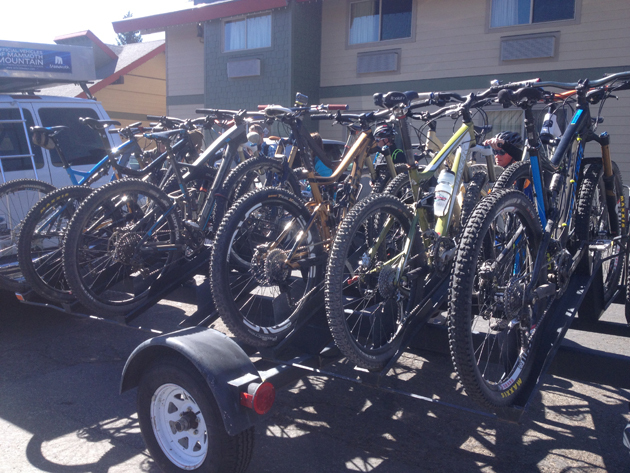 It may not be classic singletrack, it's a very different experience…I can ride up to 14,000 feet on a bike. There are not a lot of places you can do that," Wentworth says.